The 10th International Symposium and the General Meeting of International Association for Transport Universities in Asia-Pacific Countries were held by Korea National University of Transportation from October 31, 2017 to November 4, 2017. The 9th International Symposium for Railroad Universities in Europe and Asia. Russia, Ekaterinburg, Urals State Transport University. June, 2016. May 14th 2014, Dalian. The last day of the 7th International Symposium for Railway Universities hosted by the Dalian Jiaotong University. The Symposium gathered together 11 IASTU APC member universities, 3 universities as guest participants and managers of the major railway companies of People’s Republic of China. 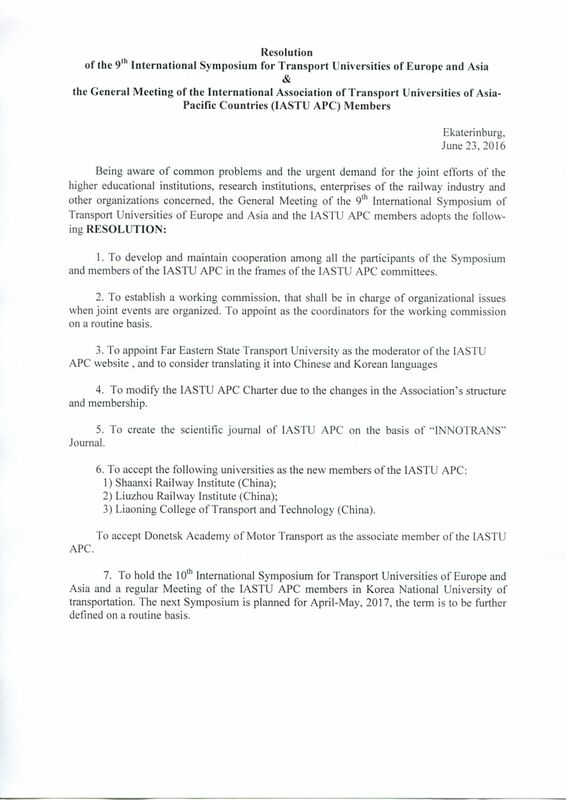 On April 10-12, 2013 Korea National University of Transportation hosted the 6th International Symposium for Railroad Universities in Europe & Asia, and the General meeting of IASTU APC members. May 31st – June 1st, 2012. Kazakh Academy of Transport and Communication (Kazakhstan) hosted the 5-th International Simposium For Railroad Universities in Europe & Asia. May 30– June 1, 2011. Nanjing, China. Delegates from Far Eastern State Transport University participated in the 4th International Symposium for Railroad Universities in Europe and Asia, which was hosted by Nanjin Institute for Railway Technology. October 13-15, 2009. Khabarovsk, Russia. Far Eastern State Transport University (FESTU) hosted the 3rd International Symposium for Railroad Universities in Europe and Asia. December 12, 2008. Seoul, Republic of Korea. Korean National Railroad College hosted the 2nd International Symposium for Railroad Universities in Europe and Asia. October 10, 2007. Seoul, Republic of Korea. Korean National Railroad College hosted the 1st International Symposium for Railroad Universities in Europe and Asia. 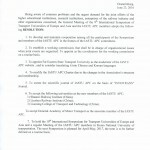 On June 21-23, 2016, the 9th International Symposium for Railroad Universities in Europe and Asia will be hosted by Ural State University of Railway Transport (USURT, Yekaterinburg, Russia), as well as the next General meeting of the IASTU APC members. Nanjing, China. 8th International Symposium for Railroad Universities in Europe and Asia was held in Nanjing Institute of Railway Technologies. Among the topics, discussed at the Symposium, were development of transport corridors and related technologies, Europe-Asia partnership. It was mentioned by all reporters, that new technologies require constant renovation of transport education system. Therefore training of world-class experts, especially for high-speed railways, was the key topic of the Symposium. On June 10-13, 2015, Nanjing Institute of Railway Technology will hold the 8th International Symposium for Railroad Universities in Europe and Asia, and General meeting of IASTU APC members.